Galatasaray Medical Park knocked out rival Anadolu Efes with a 64-56 victory on Wednesday in Turkish Airlines Euroleague Group E. The victory lifted Galatasaray to 3-2 in the standings, but head coach Oktay Mahmuti’s men must win next week at Olympiacos to reach the playoffs. Efes dropped to 1-4 and saw its dream of playing in the Turkish Airlines Euroleague Final Four on its home court disappear. It was a bruising, hard-fourth game throughout, though the hosts raced out to an 8-2 start and never trailed again. Efes had the ball down 6 a number of times in the closing minutes, but was denied every time. Luksa Andric paced the hosts with 15 points and 7 rebounds, while Jaka Lakovic, Josh Shipp and Jamon Lucas added 9 each. Stanko Barac led Efes with 16 points and Sasha Vujacic tallied 15 points and 8 rebounds in defeat. Esteban Batista muscled his way to the first points of the game for the visiting team. 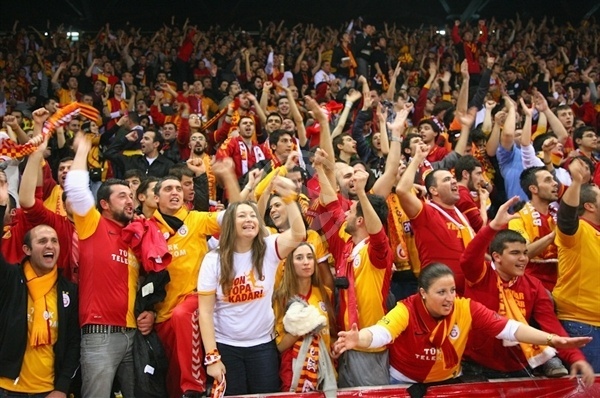 Shipp countered with a three-pointer to the delight of the Galatasaray faithful. Points became hard to come by despite the free-flowing nature of the first few minutes. Andric came alive quickly with 5 straight points as the hosts looked to take control at 8-2. Vujacic penetrated for an Efes layup. Lucas buried a three only to see Sinan Guler match him at the other end. Vujacic narrowed the gap to 11-8 from the line. Andric scored again inside and Lucas took a steal in for a layup as the hosts remained ahead, 17-11. 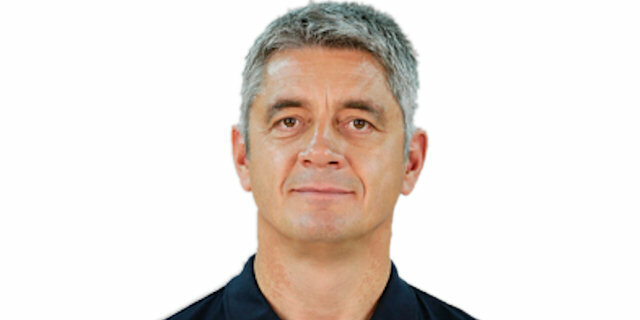 Dusko Savanovic netted his first points for Efes from the line, however another Andric bucket gave him 9 first-quarter points and Lakovic split free throws to make it 20-13 after 10 minutes. Preston Shumpert snapped out of a lengthy shooting slump with a triple to open the second quarter, which took Galatasaray’s lead to double figures. 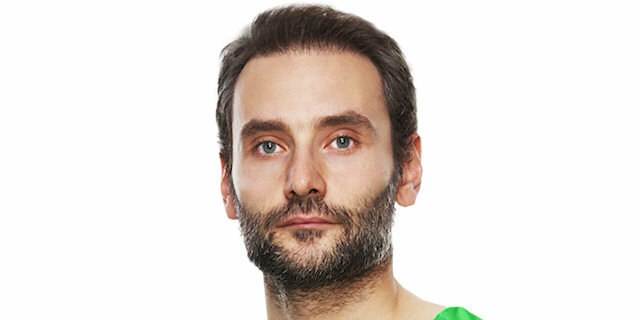 Barac scored inside for the visitors, but Furkan Aldemir attacked the glass for a Galatasaray basket. Tarence Kinsey trimmed the gap with 2 free throws, however Ender Arslan drained a pull-up three-pointer to push the hosts ahead 32-21. After Shumpert’s cross-court pass to Caner Topaloglu for an open jumper, Efes called timeout to talk things over. Barac worked hard inside to score a hook shot but a loose ball pick up gifted Lucas a layup to keep the hosts in control. Free throw woes hurt the visitors and when Lakovic pulled up for an open three, Galatasaray had its biggest lead yet, 39-24. Vujacic scored in transition and Savanovic stepped up on the defensive end. 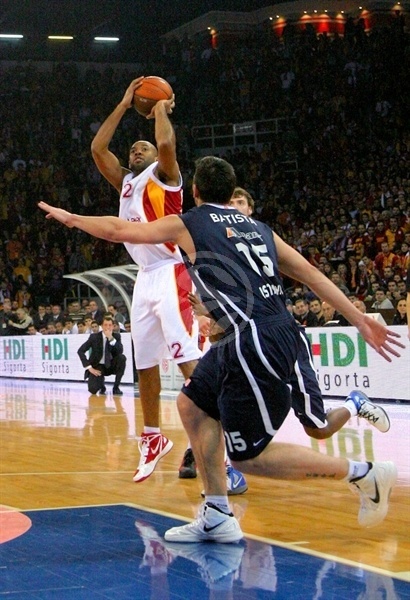 Oliver Lafayette banged inside for an offensive rebound and foul drawn, which despite the din created by the Galatasaray support, he turned into 2 free throws. After Andric missed twice from the line, Batista scored inside and Guler penetrated for another basket to close the gap to 39-32 at halftime. 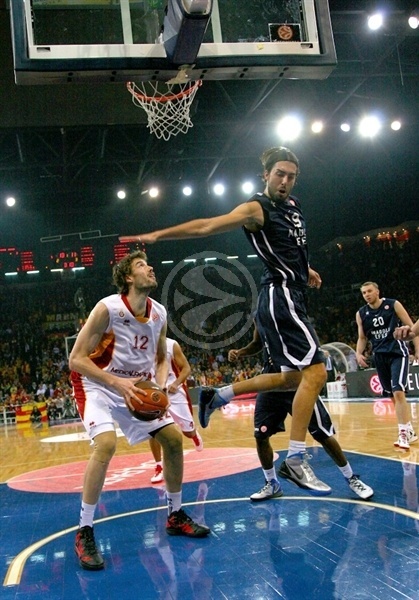 Efes started the second half as it hoped with a Vujacic triple. But Efes suffered a blow when Batista suffered an apparent knee injury and needed to be carted off. Andric and Barac, who came in for Batista, traded baskets. Barac, who had missed 3 free throws in the first half, made 2 to put 43-39 on the scoreboard. Lakovic pulled the hosts back out to 48-39 as the hosts quickly regained control. Barac remained Efes’s go-to guy with a score in the paint. Vujacic drew a foul shooting a jumper and clawed Efes within 5. Kerem Tunceri whipped a great pass to Savanovic for a slam, but Shipp put the hosts ahead 50-45 after three quarters. An Arslan three and a steal and layup by Shipp lifted the Galatasaray lead back to double figures. Tunceri hit back with a three-pointer, but the Galatasaray defense stiffened up after that and a Shumpert three-pointer soon had the hosts back in the driver’s seat, 58-48. Andric and Barac swapped baskets again as the hosts refused to let Efes get back in the game. After some great defensive stops on both ends, Lafayette connected on a second-chance three-pointer to make it 60-54 with four minutes to play. Arslan penetrated and dropped in a floater to bring a round of cheers from the stands. Barac countered with a foul line jumper, but was called for travelling the next time he touched the ball. Vujacic missed a long three, but after a poor pass from Lakovic, Barac went to the line with 55 seconds left. However he missed twice and even though Efes stopped Galatasray at the other end, Barac missed at the rim and Lakovic iced the game from the line, 64-56, with 15.6 seconds left. "It was a tough and competitive game. At the end of the second quarter , we lost control of the game and our rhythm, so we lost our score advantage. We always controlled the game in the second half . We won against a really good team . So next week we will give our best effort to win and qualify." "First of all, I would like to congratulate Galatasaray Medical Park for their win and the great atmosphere created by their fans. Generally we were good on defense, but on offense, because of our bad decisions and easy turnovers, we lost tonight." "We are happy we won tonight in this beautiful atmosphere. I would like to thank our fans for this beautiful atmosphere. To win against a great team like Efes is really important. Now the whole team waits for next week."